It’s once again open enrollment time for those seeking individual coverage through state and federal health insurance exchanges. My mother is a small business owner and my father works part-time and doesn’t qualify for health insurance through his employer; thus, like millions of other Americans, they rely on their state marketplace to get covered. Unfortunately for them, there is only one insurer providing plans in Alaska, and the premiums are as big as the state they live in: $2,100 per month for a bronze plan with a $10,000 deductible. It’s a familiar storyline that shows up around this time every year, as we continue to debate the merits of the Affordable Care Act. Some of the criticism is certainly justified—health insurance is still too expensive for many families and while the rate of growth for costs has slowed, health care is still getting more costly each year. But in other ways, the landmark legislation is a massive success. Our uninsured rate is lower than ever, largely due to the expansion of Medicaid in 31 states. This expansion of public coverage is arguably the Affordable Care Act’s greatest victory. States that have expanded Medicaid have seen both health and economic benefits, and nearly 17 million more Americans have coverage because of it. Here in Colorado, Health First Colorado, Colorado’s Medicaid program, provides essential health care services to 1.3 million Coloradans—half of whom are children—and its expansion in 2014 has added over 31,000 jobs and $3.8 billion in economic activity to Colorado’s economy. 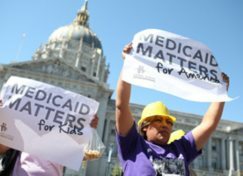 Those who gained access to Medicaid—which, in Colorado, was primarily working adults—gained access to a health care system that actively excludes the uninsured. Colorado saw an increase in the number of people getting preventive care services, like well child visits and colonoscopies, and a decrease in the number that couldn’t afford health care or had trouble paying medical bills. Furthermore, the expansion helped hospitals and safety net clinics financially by reducing charity care and increasing insurance reimbursements (PDF). With nearly one in four Coloradans now covered through Health First Colorado, it’s the largest provider of health care insurance in the state, producing healthier Coloradans and a healthier Colorado economy. The Affordable Care Act will require work over the coming years to ensure it achieves all the lofty goals it laid out for itself, but Medicaid’s increased role in our health care system has already changed millions of lives for the better. And while most headlines are currently focused on the struggles of the private health insurance marketplace (which, to be clear, affects a very small percentage of Americans), I’m sure we’ll start to see headlines about Health First Colorado soon enough. We’re approaching the start of a new legislative session, and you can’t have a state budget discussion without talking about Medicaid! However, for now, seeing as it’s the season to give thanks, and Medicaid’s contributions are both significant in scale and important in impact, we should celebrate. For all you do for our friends, our families, our communities, and our economy—thanks, Medicaid.